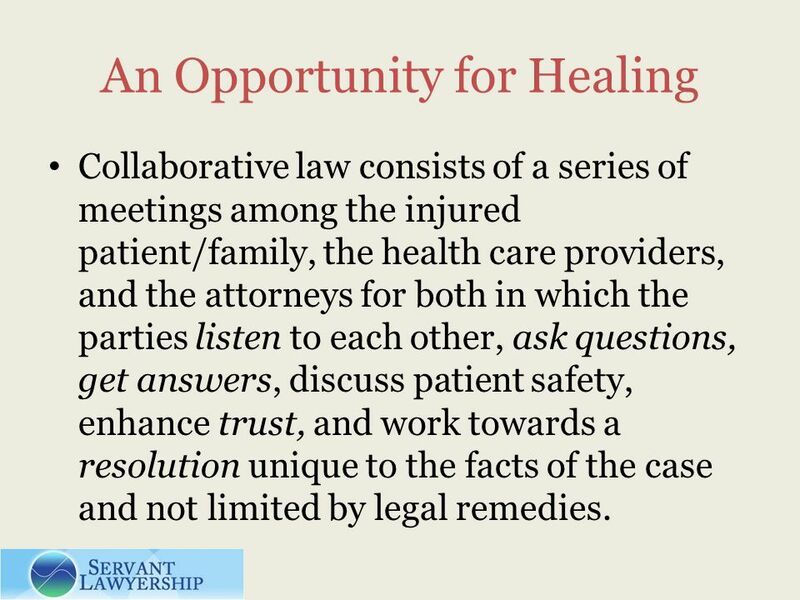 5 An Opportunity for Healing Collaborative law consists of a series of meetings among the injured patient/family, the health care providers, and the attorneys for both in which the parties listen to each other, ask questions, get answers, discuss patient safety, enhance trust, and work towards a resolution unique to the facts of the case and not limited by legal remedies. 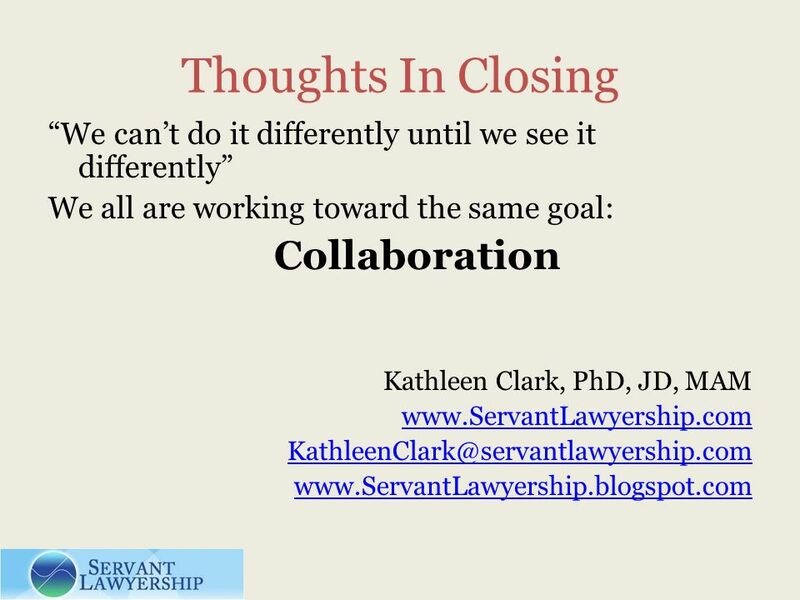 6 The Collaborative Law Process A structured, voluntary, non-adversarial, respectful process in which all parties make their own decisions. 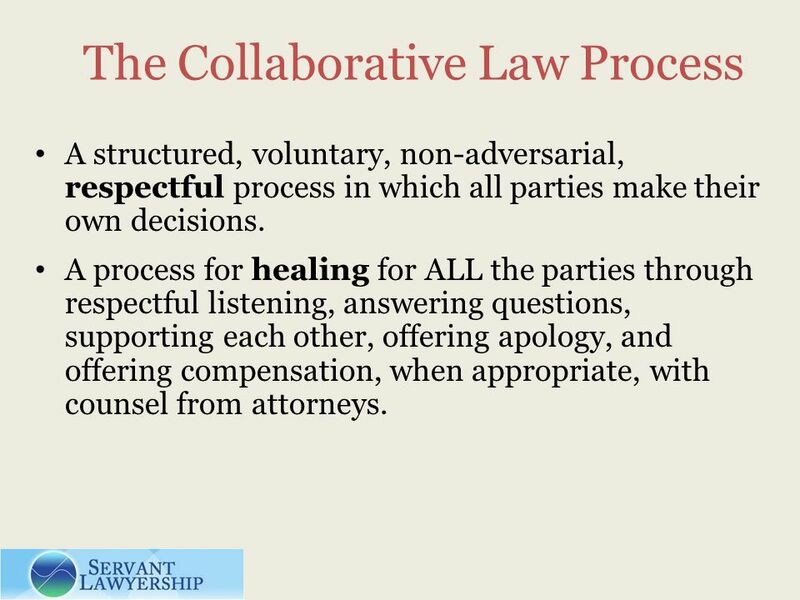 A process for healing for ALL the parties through respectful listening, answering questions, supporting each other, offering apology, and offering compensation, when appropriate, with counsel from attorneys. 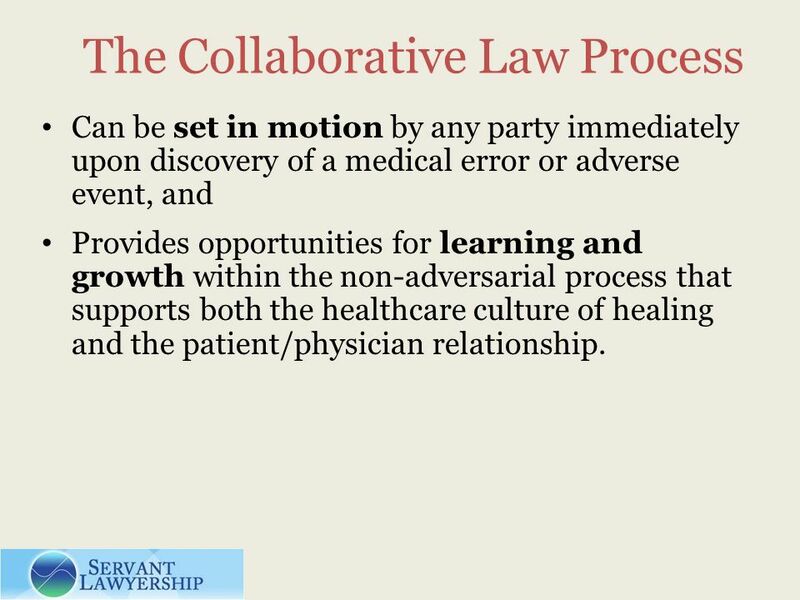 7 The Collaborative Law Process Can be set in motion by any party immediately upon discovery of a medical error or adverse event, and Provides opportunities for learning and growth within the non-adversarial process that supports both the healthcare culture of healing and the patient/physician relationship. 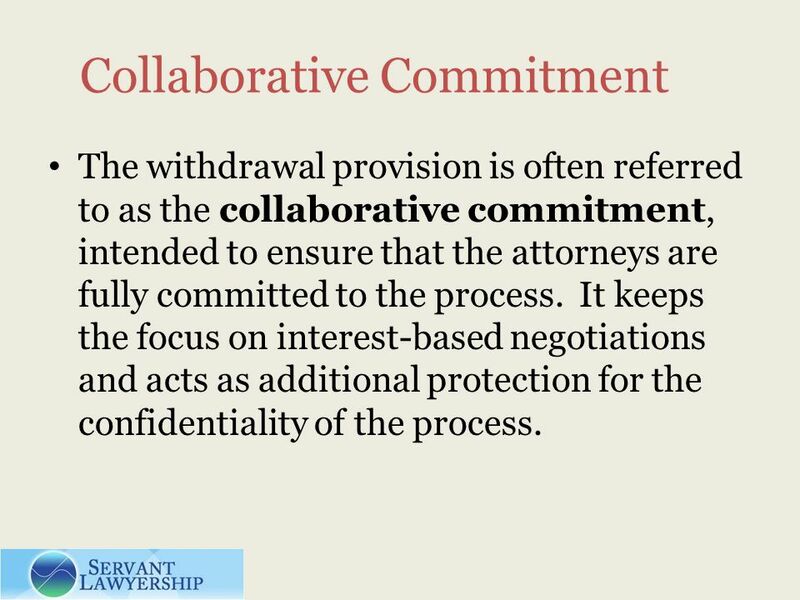 9 Collaborative Commitment The withdrawal provision is often referred to as the collaborative commitment, intended to ensure that the attorneys are fully committed to the process. 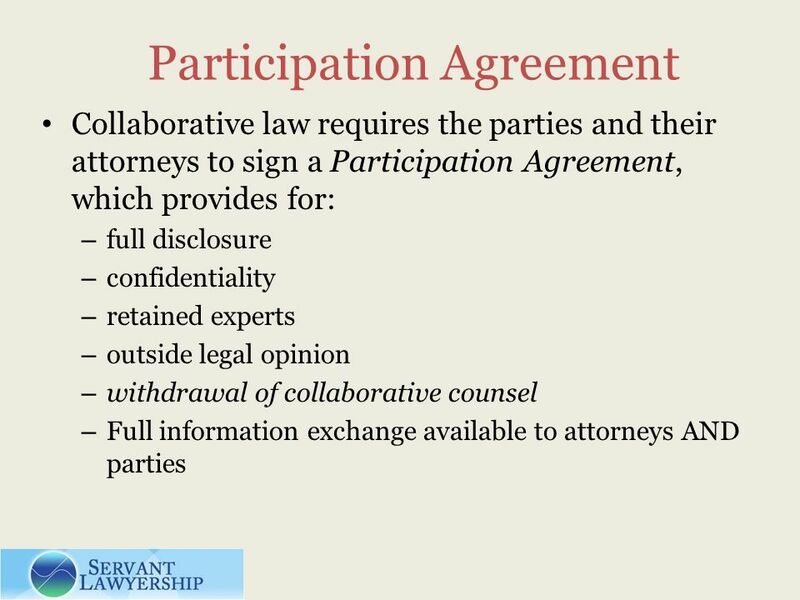 It keeps the focus on interest-based negotiations and acts as additional protection for the confidentiality of the process. 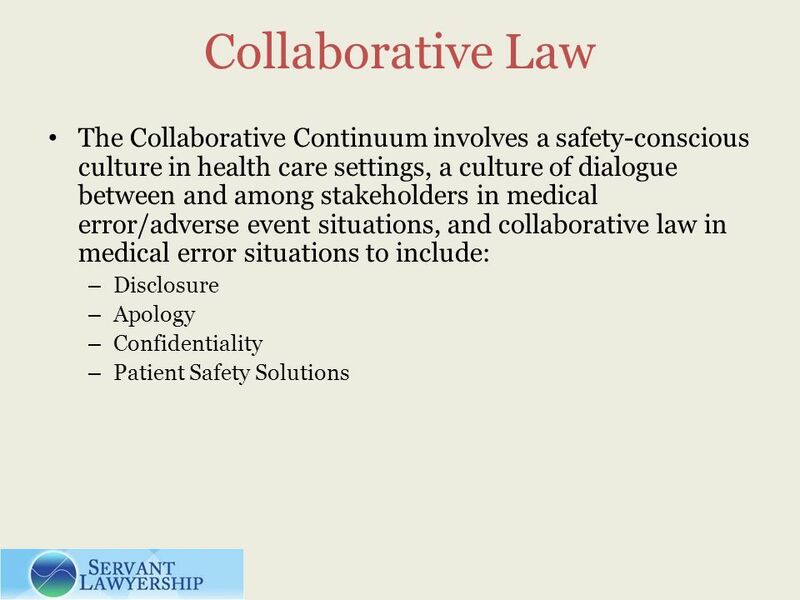 14 Traditional Medical Malpractice Litigation Tort law is adversarial by nature; a culture of safety is collaborative. 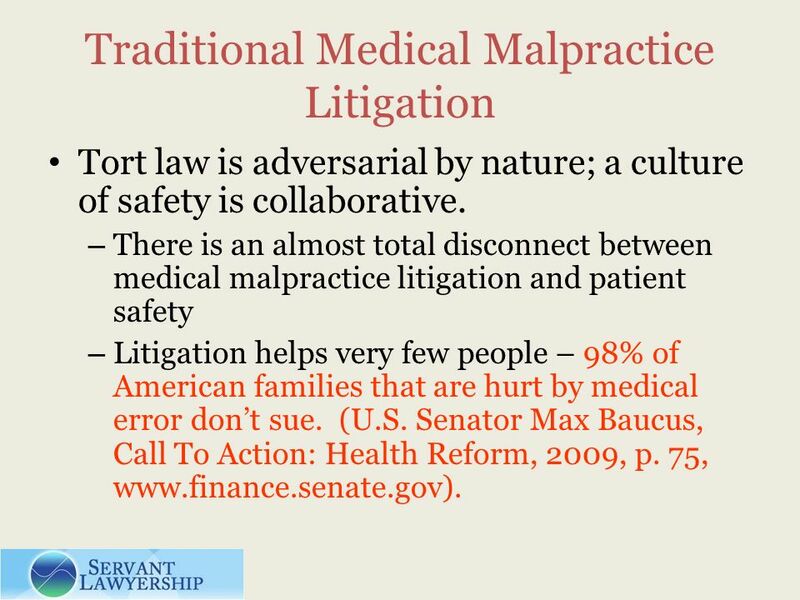 – There is an almost total disconnect between medical malpractice litigation and patient safety – Litigation helps very few people – 98% of American families that are hurt by medical error dont sue. (U.S. Senator Max Baucus, Call To Action: Health Reform, 2009, p. 75, www.finance.senate.gov). 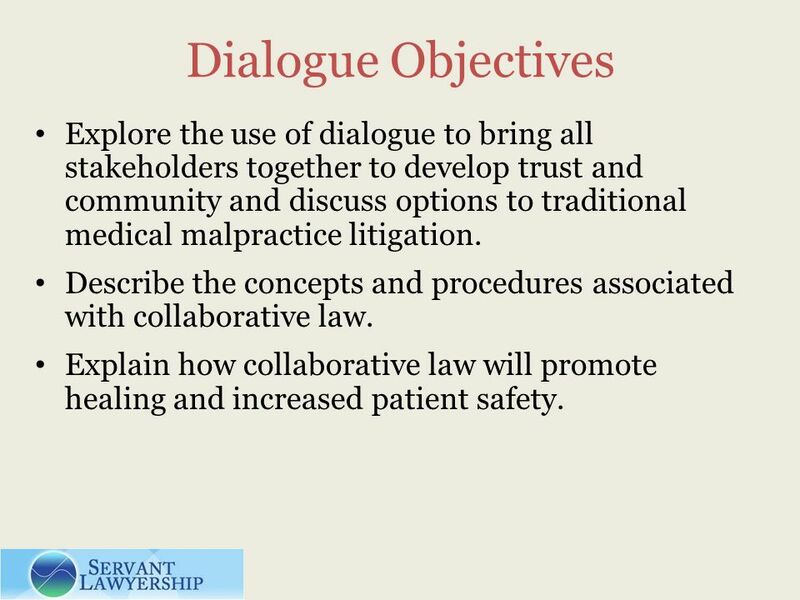 19 Dialogue Objectives Explore the use of dialogue to bring all stakeholders together to develop trust and community and discuss options to traditional medical malpractice litigation. 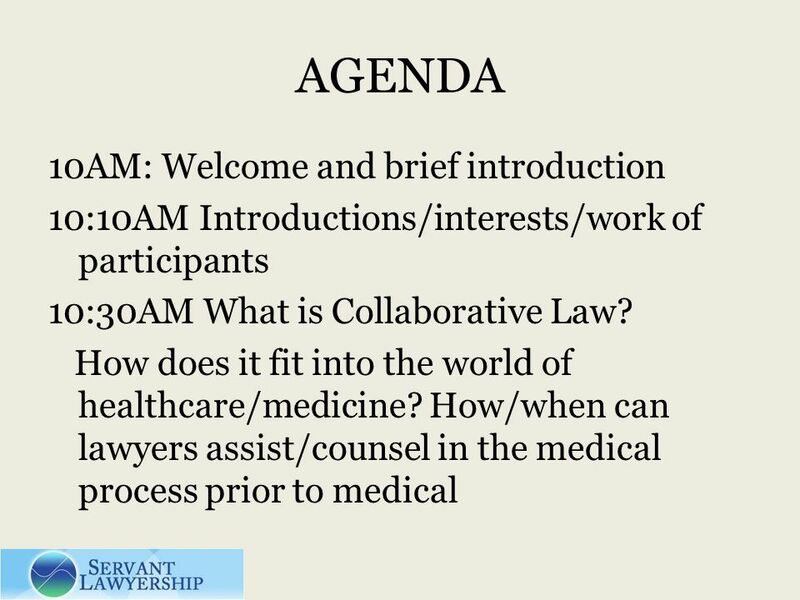 Describe the concepts and procedures associated with collaborative law. 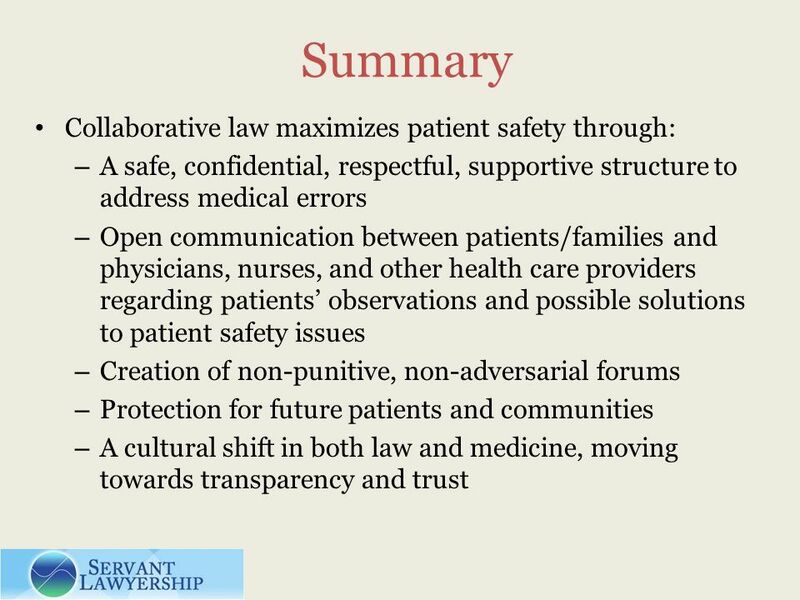 Explain how collaborative law will promote healing and increased patient safety. 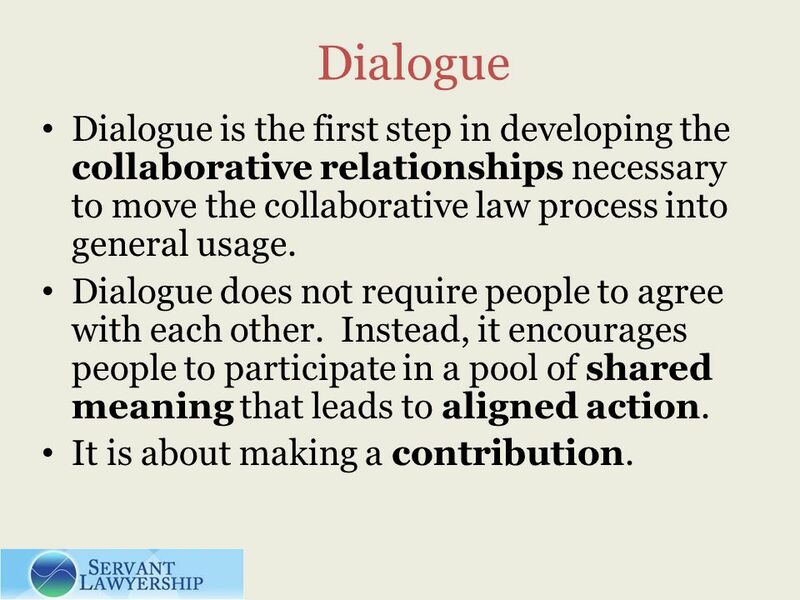 20 Dialogue Dialogue is the first step in developing the collaborative relationships necessary to move the collaborative law process into general usage. 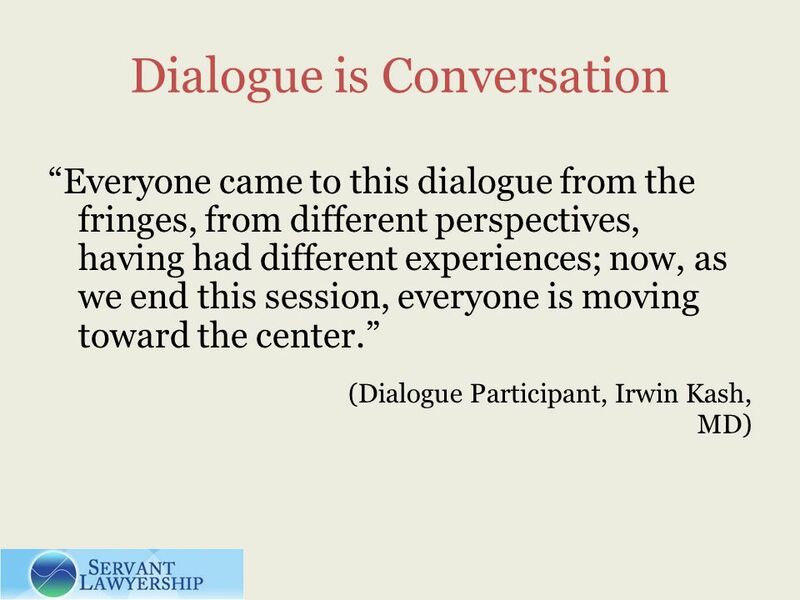 Dialogue does not require people to agree with each other. 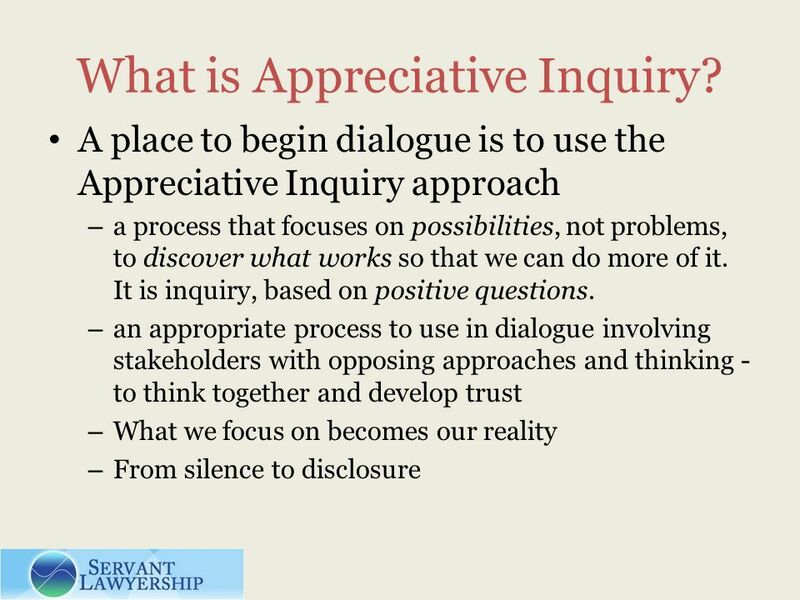 Instead, it encourages people to participate in a pool of shared meaning that leads to aligned action. 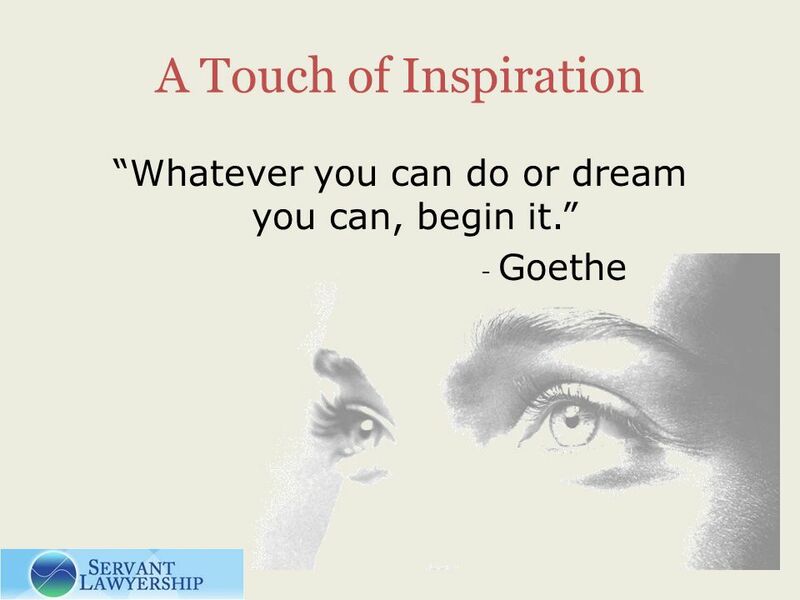 It is about making a contribution. 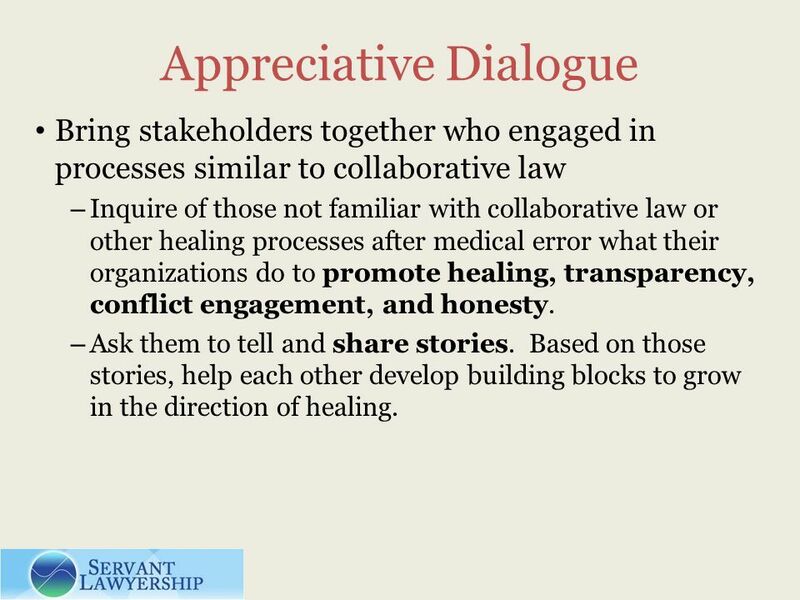 24 Appreciative Dialogue Bring stakeholders together who engaged in processes similar to collaborative law – Inquire of those not familiar with collaborative law or other healing processes after medical error what their organizations do to promote healing, transparency, conflict engagement, and honesty. – Ask them to tell and share stories. 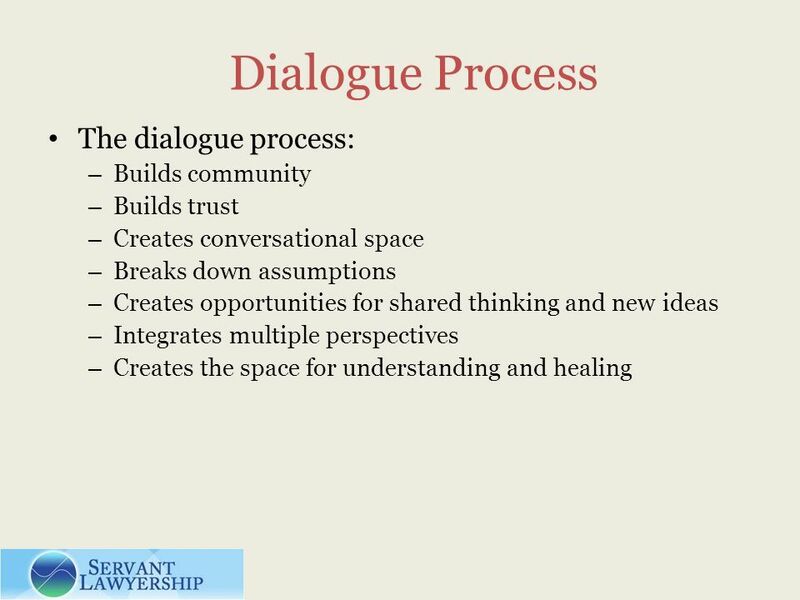 Based on those stories, help each other develop building blocks to grow in the direction of healing. 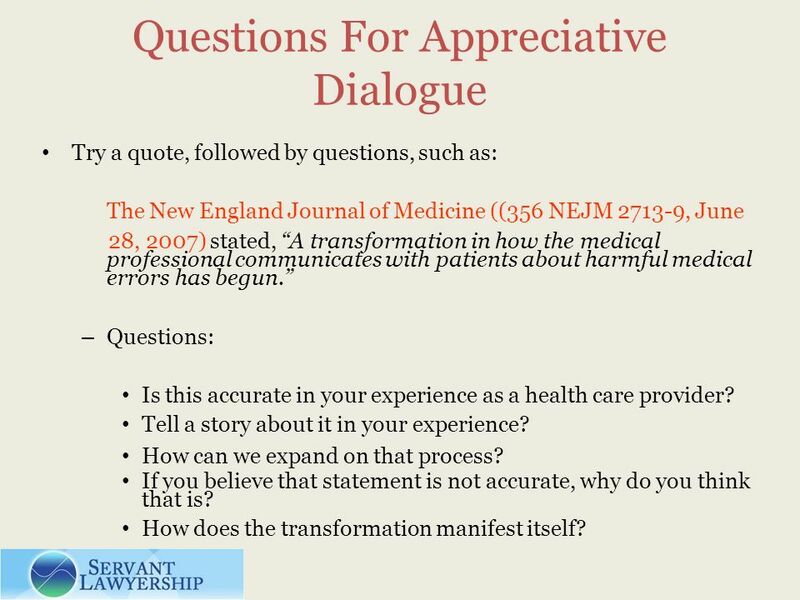 26 Questions For Appreciative Dialogue Try a quote, followed by questions, such as: The New England Journal of Medicine ((356 NEJM 2713-9, June 28, 2007) stated, A transformation in how the medical professional communicates with patients about harmful medical errors has begun. 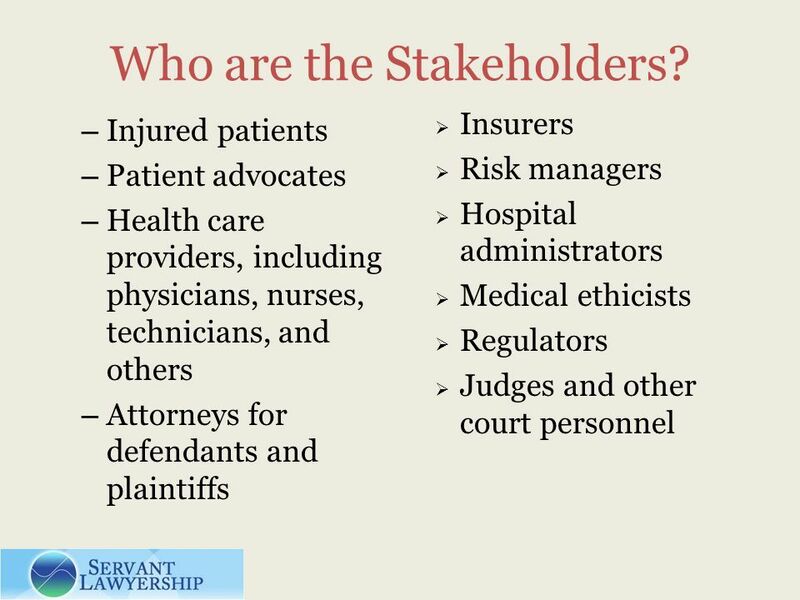 – Questions: Is this accurate in your experience as a health care provider? Tell a story about it in your experience? How can we expand on that process? If you believe that statement is not accurate, why do you think that is? How does the transformation manifest itself? 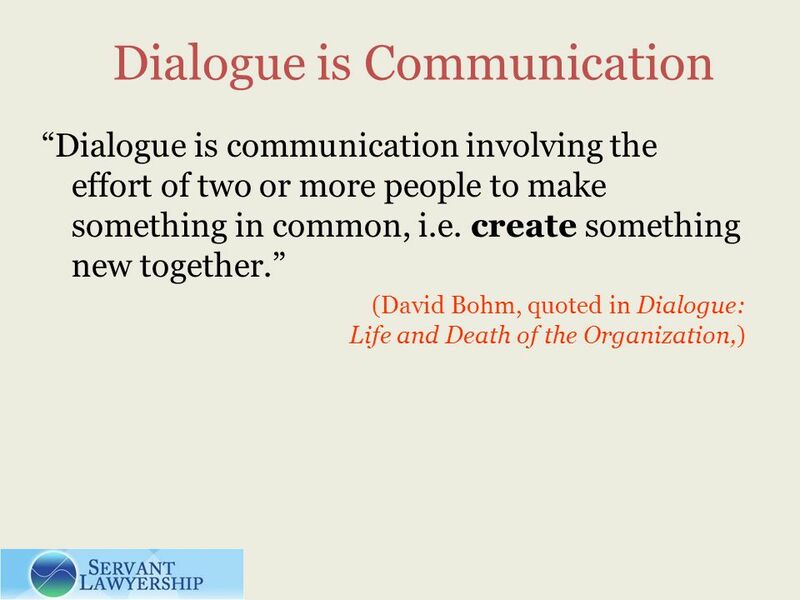 27 Questions for Dialogue, cont. 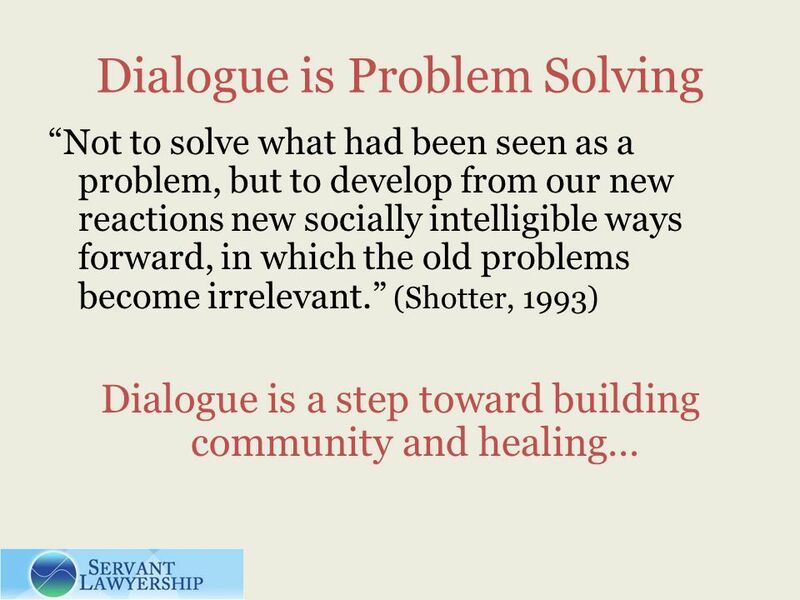 What can you do that could bring about change leading to a climate of healing? 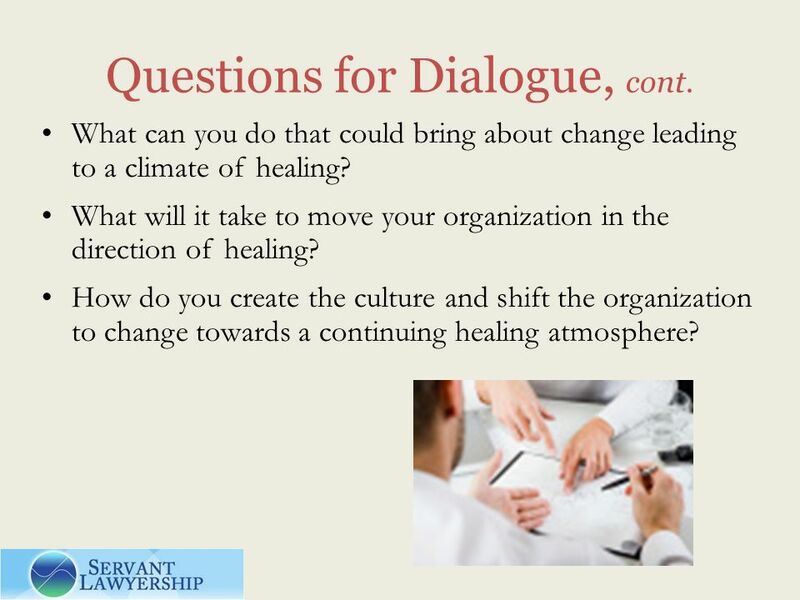 What will it take to move your organization in the direction of healing? 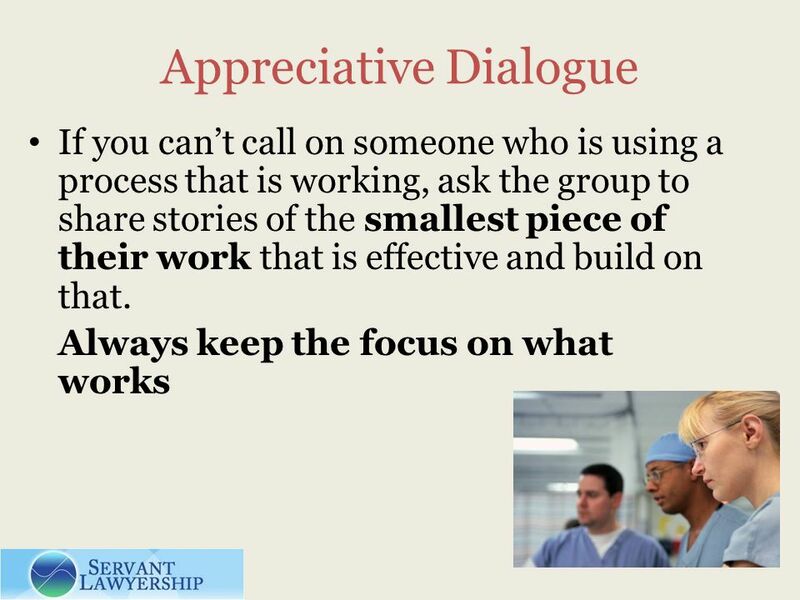 How do you create the culture and shift the organization to change towards a continuing healing atmosphere? 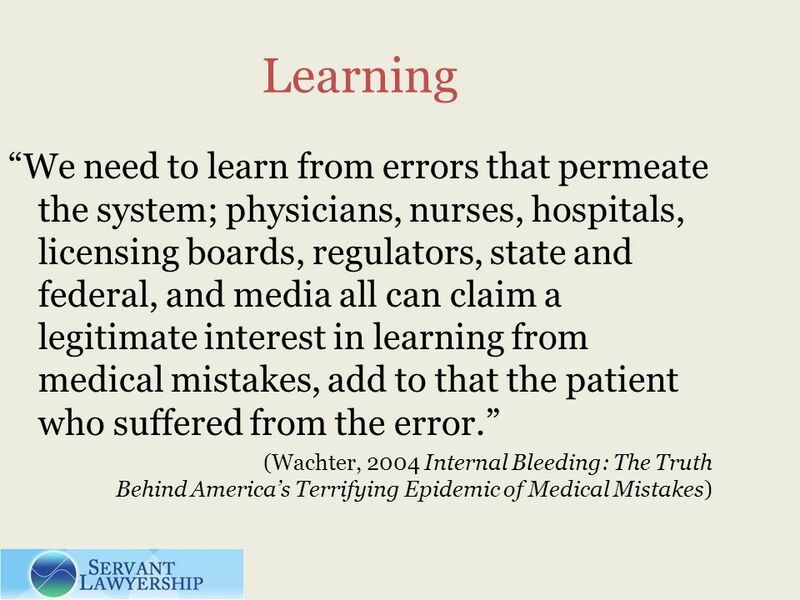 29 Patient Safety 98,000 deaths in U.S. each year result from medical error and 90 % of these deaths are the result of failed systems and procedures. 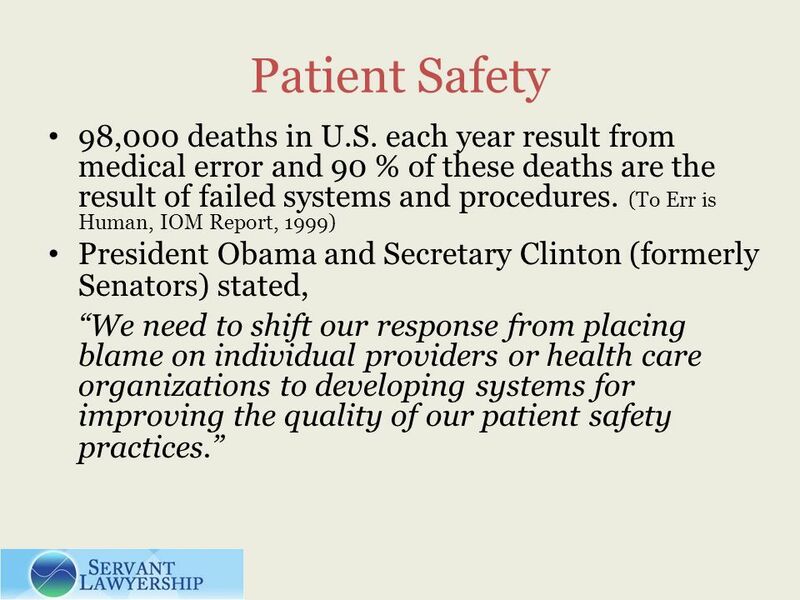 (To Err is Human, IOM Report, 1999) President Obama and Secretary Clinton (formerly Senators) stated, We need to shift our response from placing blame on individual providers or health care organizations to developing systems for improving the quality of our patient safety practices. 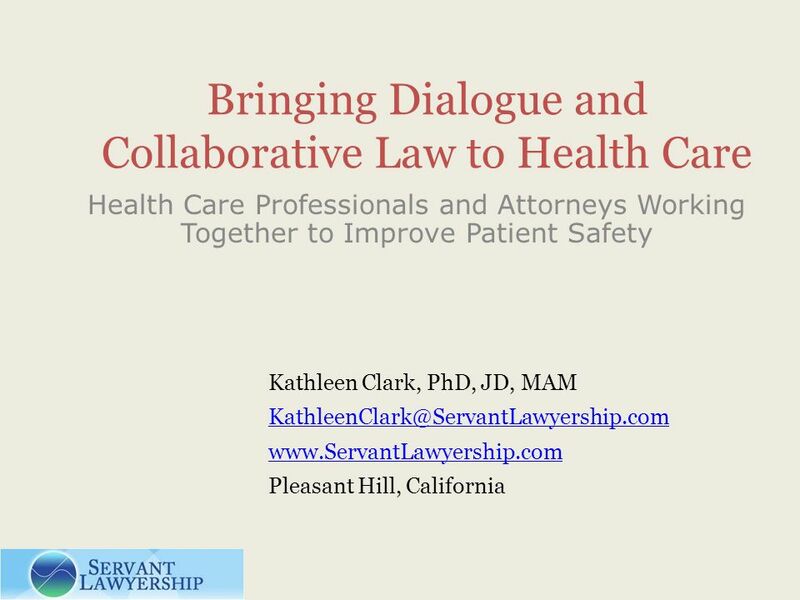 Download ppt "Bringing Dialogue and Collaborative Law to Health Care Health Care Professionals and Attorneys Working Together to Improve Patient Safety Kathleen Clark,"
Patient Engagement: Begins with Patient- and Family- Centered Care Bernard Roberson, MSM, BA, HSC Administrative Director Patient and Family Centered Care. Prevention & Disclosure of Medical Error Dr. Ramadan Ibrahim Director Health Regulation Department Dubai Health Authority. Last Topic - National Security Measures taken to ensure national security include Pakistan National Security Council (PNSC) Elements of National Security. Canadian Disclosure Guidelines. 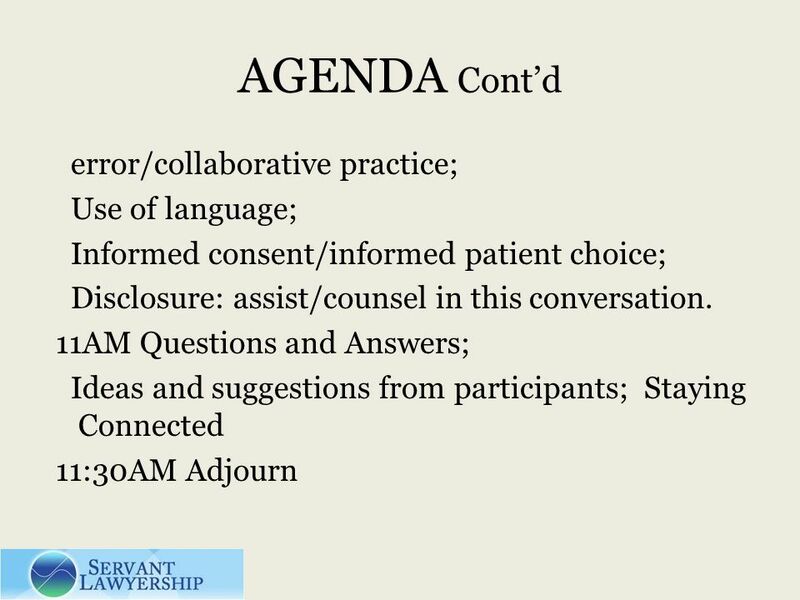 Disclosure - Background Process began: May 2006 Background research and document prepared First working draft created. Medical PROFESSIONALISM in the next millennium ABIM foundation ACP foundation European Federation of IM. 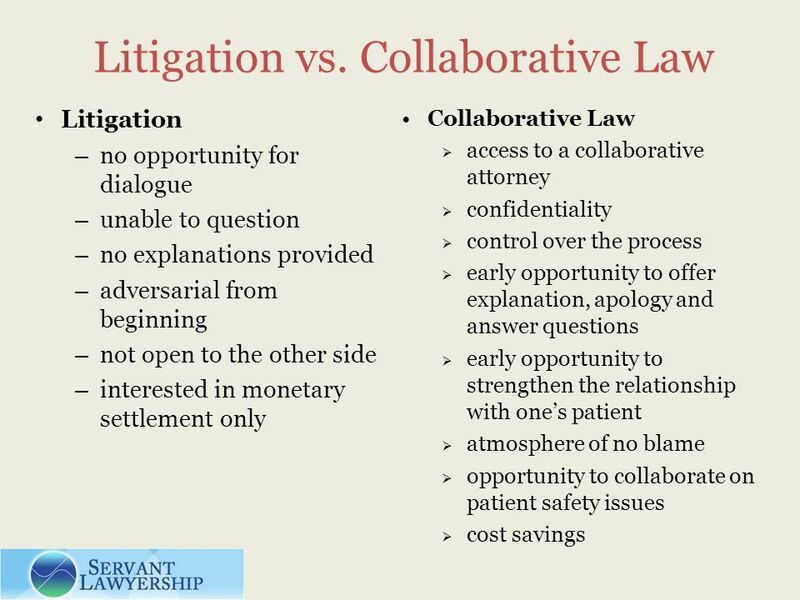 1 The Collaborative Family Law Process 101: A New Role for the Family Law Attorney By: Dawn Anderson. 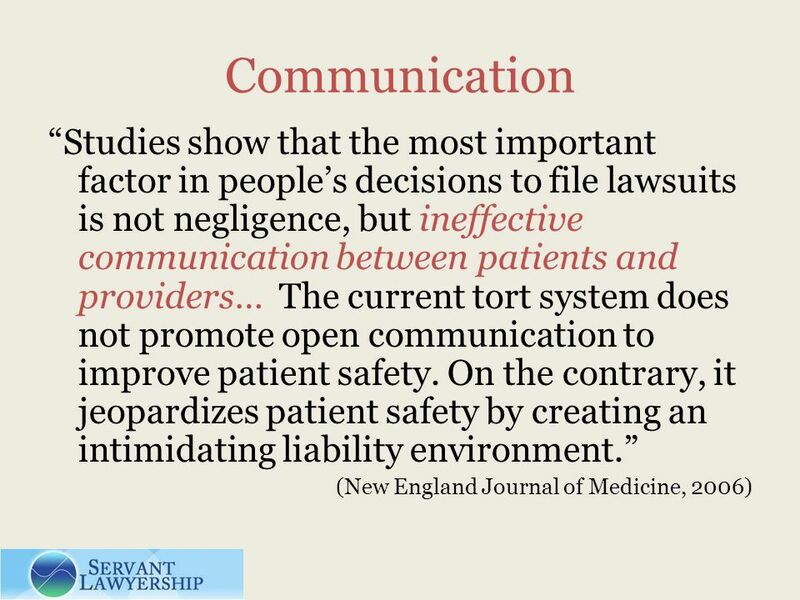 Ethics Committees and Medical Error Carol Bayley, PhD July 6, 2011 Ethics Champions Program. 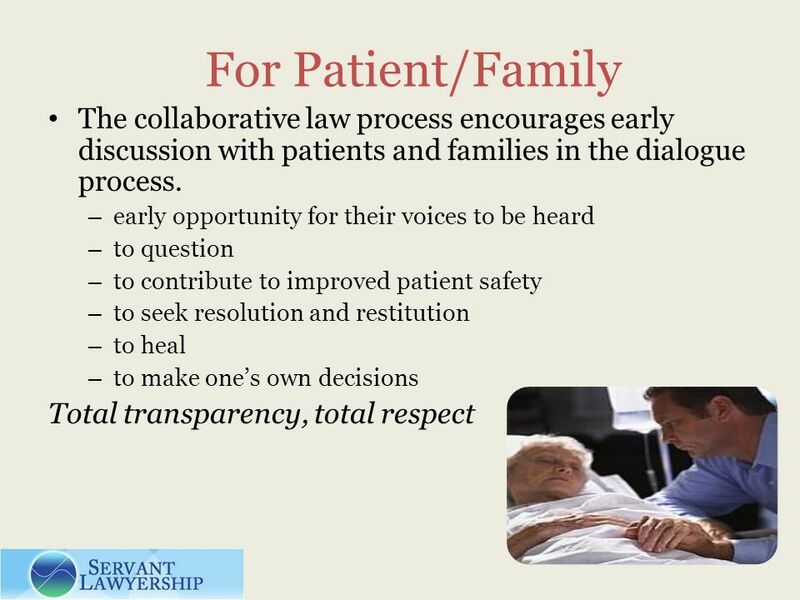 NNEPQIN as a Patient Safety Organization NNEPQIN Fall Meeting November 14, 2009 Timothy J. Fisher, MD. 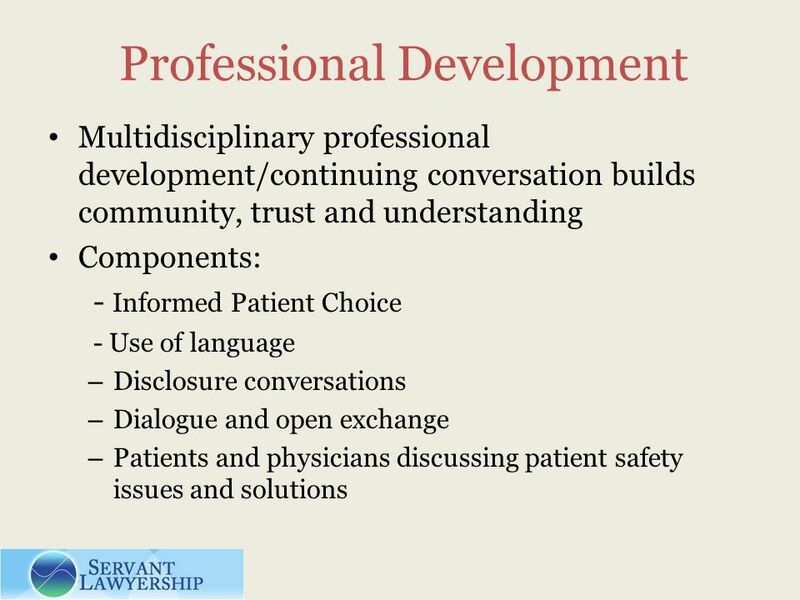 Outline Definition of ethics Definition of nursing ethics Professional values Code of nursing ethics Legal aspects of nursing practice Illegal aspects. What are Parent’s Rights in Georgia Special Education? Parents and students over age eighteen have the right … To Participate You have the right to refer.